A virtual disk contains two components: the virtual disk itself as it appears in a guest domain, and the virtual disk back end, which is where data is stored and where virtual I/O is sent. The virtual disk back end is exported from a service domain by the virtual disk server (vds) driver. 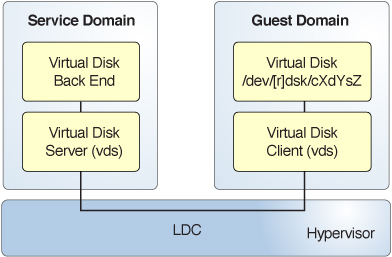 The vds driver communicates with the virtual disk client (vdc) driver in the guest domain through the hypervisor using a logical domain channel (LDC). Finally, a virtual disk appears as /dev/[r]dsk/cXdYsZ devices in the guest domain. Note - You can refer to a disk either by using /dev/dsk or /dev/rdsk as part of the disk path name. Either reference produces the same result. Caution - Do not use the d0 device to represent the entire disk. This device represents the entire disk only when the disk has an EFI label and not a VTOC label. Using the d0 device results in the virtual disk being a single-slice disk, which might cause you to corrupt the disk label if you write the beginning of the disk. Instead, use the s2 slice to virtualize the entire disk. The s2 slice is independent of the label. To use the maximum number of virtual disks on the server, ensure that the segkpsize kernel tunable has a value of at least 524288. Note that an insufficient segkpsize value might result in a guest domain hanging during boot or during a dynamic addition of a virtual disk. For more information about segkpsize, see segkpsize in Oracle Solaris 11.3 Tunable Parameters Reference Manual.